Low-Carb Lunches - how to make real-food lunch boxes - the easy way! All my eBooks are in PDF format available for immediate download worldwide. You can download them onto your desktop computer, mobile, tablet or iPad. All prices are in US dollars. If you would like to order a PRINTED copy, click HERE to purchase directly from Amazon. 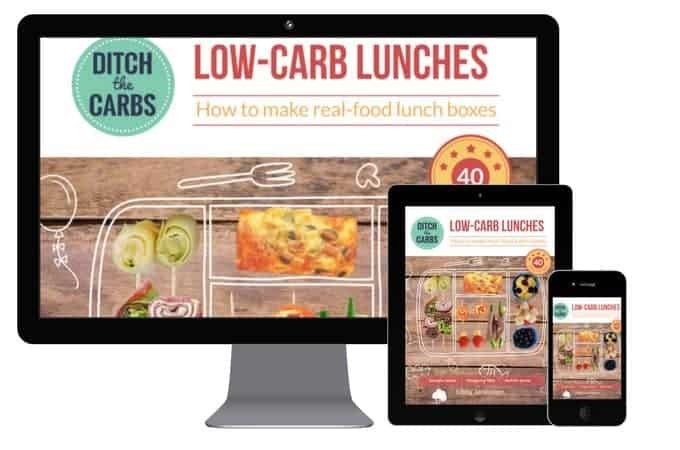 BONUS JUST ADDED: When you purchase the eBook, you also gain access to my closed Facebook group – Low Carb Lunch Box Hacks. You will learn even more tips each day and see exactly what I pack for my own children’s lunch boxes each week. ⇒ Are you confused with what to make for school lunches? ⇒ Do you dread the morning lunch-box routine? 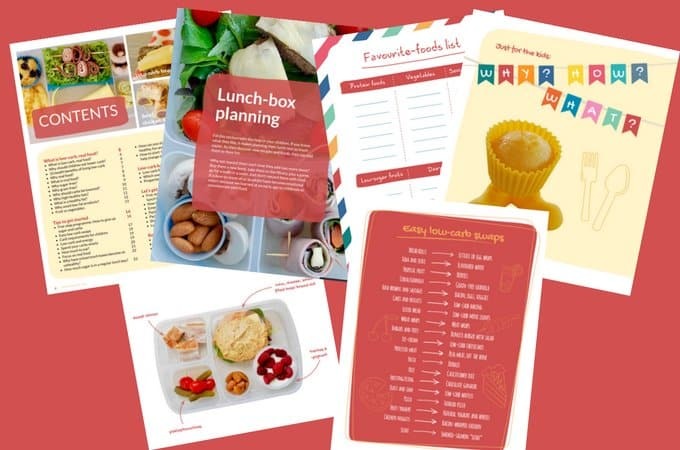 ⇒ Would you like simple ideas to pack a healthy lunch-box and snack ideas? ⇒ Are you frazzled in the mornings, and hate the thought of spending 20 minutes throwing something together – that your children probably won’t eat? ⇒ Do you want your children to eat real food, no sugars, gluten free, grain free and unprocessed, but are scared of making the change? ⇒ Or maybe you need to go low-carb to help gain better, stable blood sugars? Better, stable moods? A healthy weight? Better skin? Improved concentration? ⇒ This isn’t about doing more, it’s about doing things DIFFERENTLY!! 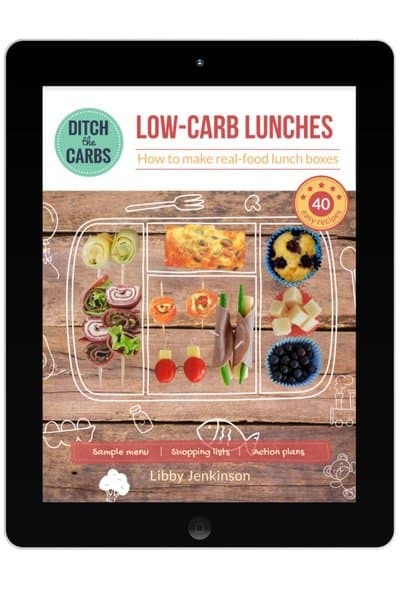 “Low-Carb Lunches” is perfect for those who just want to cut back on the junk, and for those who really need to knuckle down and go as low-carb as required to achieve stable blood sugars and weight control. My family ethos is that we are low-carb, not no-carb. We focus on low-carb foods from nutrient dense sources such as vegetables, nuts, seeds and low-sugar fruit. All my recipes have no added sugars, grain-free, gluten-free and low-carb. I use basic ingredients and the recipes are perfect for beginners. My new book will take the pain out of your morning routine. I explain the reasons why we need to ditch the sugars, ditch the grains and ditch the carbs. It’s not difficult, it’s not complicated – it just takes some practical ideas to make it work. 40+ easy recipes – nothing complicated. 10 health benefits of living low carb. What is a healthy fat? 5 step programme – slowly cut back, there’s no need to rush this major overhaul unless there is a medical reason to do so. Go slowly and kindly, your children will thank you for it. 5 step plan to making easy low-carb lunch boxes. How to start – two simple strategies to help change into a low-carb family. Practical ideas and tips to help pack your children’s lunch box each day. Low carb and real food easy-swap chart for beginners. Simple guide to low-carb flours. A handy chart for sweeteners. Which to use and which to avoid. A FAQ written just for children, because if they understand why you are doing this, it will help the transition. Recipes your children can make. Let them help, let them choose and plan. Many recipes can be made for dinner, then the leftovers kept for their lunch box the next day (a double win). Foods that you should always keep in your fridge, freezer and pantry at all times to avoid the 7am panic. Favourite food lists, for your children to complete. Lunch box planner (with a sample lunch box plan). It truly doesn’t have to be difficult to start. Eating real food shouldn’t be complicated. Food should be easy and simple. Start today and feel proud of yourself for making this first step to the new family you have always wanted to be.